"I always start with squares", said Louis Kahn. - The Fisher House, also known as the Norman Fisher House was designed by the architect Louis I. Kahn and built for Dr. Norman Fisher and his wife, Doris, a landscape designer, in 1967 in Hatboro, Pennsylvania. Characterized by its dual cubic volumes, stone foundation and detailed cypress cladding, the Fisher house stands as a clear statement of how Kahn was working at the time and how his work differed from that of his contemporaries. In the Fisher House, Kahn eschews the linearity of the modern plan and focuses on a simple geometry, allowing the cubes to provide a separation of public and private space. Known widely for monumental works like the Salk Institute and the Richards Medical Center, the Fisher house stands as a testament to Kahn’s ability to work with the details of small residential architecture. The Fisher House uses form to separate the different programmatic uses of a home. The public and private are divided between two distinct two story nearly cubic volumes. The private volume is aligned along the north south axis and the public, which is rotated exactly 45 degrees, is aligned along a northeast southwest line which runs parallel to the driveway. The public volume intersects the north face of the private with its southeast corner. The public space, which is perfectly square in plan, holds the entrance corridor and the master bedroom at ground level and two other bedrooms above. The second volume is slightly off square, having a rectangular plan, and holds the living, dining and kitchen space in a double height room. Throughout the house there are deeply recessed windows. These allow light in during winter and keep out direct light in summer. The deep recession also allows them to be opened during storms without allowing rain to come into the house. There is a large stone hearth just off center in the living cube that creates a slight separation in the living room and the kitchen area, but the kitchen still opens more to the public realm that was traditionally the case at this time. The decision to create two distinct volumes was driven by the original dual design requirement of home and physician’s office. Though the office was dropped, the two volumes remain and serve well the need for privacy in a home. The house stands on a platform, built with a lattice of wooden pillars on which to build the beams that lead to the construction of the plants below. To adapt to the slight inclination of the terrain, Kahn gave Fisher the house of a stone base that compensates for the change of slope and offers a lower level overlooking the garden. A loved Kahn stone, the materials from the ruins of antiquity that had so admired during his stay in Rome. Pennsylvania was cheaper to build in wood, so that, for the house Fisher, Kahn took smoothly traditional technology of the platform structure. But the sun was leaning toward a river and there was a need for a basement for storage. Therefore, Kahn was able to use masonry walls as a base for the wooden structure, taking it even to the heart of the living room, in the form of a home semi. The facade of the entire house is made of wood. The outer coating of the facades is of cedar wood. 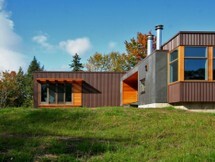 The house consists mainly of a vertical wood siding. The Fisher House lies in the midst of a prolific period of design for Kahn. It is bookended by the Margaret Esherick house and the Phillips Exeter Academy Library and was built during the same period as the Salk Institute. Like many architects, Kahn used his housing commissions to test his ideas about architecture. Kahn sought a sense of monumentality and longevity in his work, but also strove to bring the ideas of modernism to a place of familiarity. In the Fisher house, Kahn uses the stone plinth to create a sense of timelessness. In this plinth he has created a piece of archeology. The woodwork used in the Fisher house creates the sense of warmth and tradition to an otherwise starkly modern design. i think that norman fisher house is the best house in the group of kahn house.